Life less hurried, living in the slow lane: making bread that is not a brick. making bread that is not a brick. Homemade bread, there is nothing like it. The smell as it wafts through the house seems so warm and inviting, it can bring family and friends together in an instant; but the opposite is true when the bread turns out like a brick. How many times have you tried to make bread and it turns out anything but light, fluffy, and inviting? Sometimes it seems that bread bricks are easy to make, it is especially true with 100% whole wheat breads. There are very few recipes out there that contain 100% wheat flour, and those recipes are notorious for ending up in the brick category. As I was in Chef school and learning about bread making there was a notion that you cannot make 100% whole wheat bread that is good to eat. There was an unwritten rule that at least half of the flour has be white flour. I was being trained to work for the factories making modern breads like the ones I grew up with. These "so called" wheat breads were made by taking a white bread dough and adding a bit of wheat flour for taste and color, sometimes caramel coloring was added to turn the bread brown, but It was not whole wheat bread. 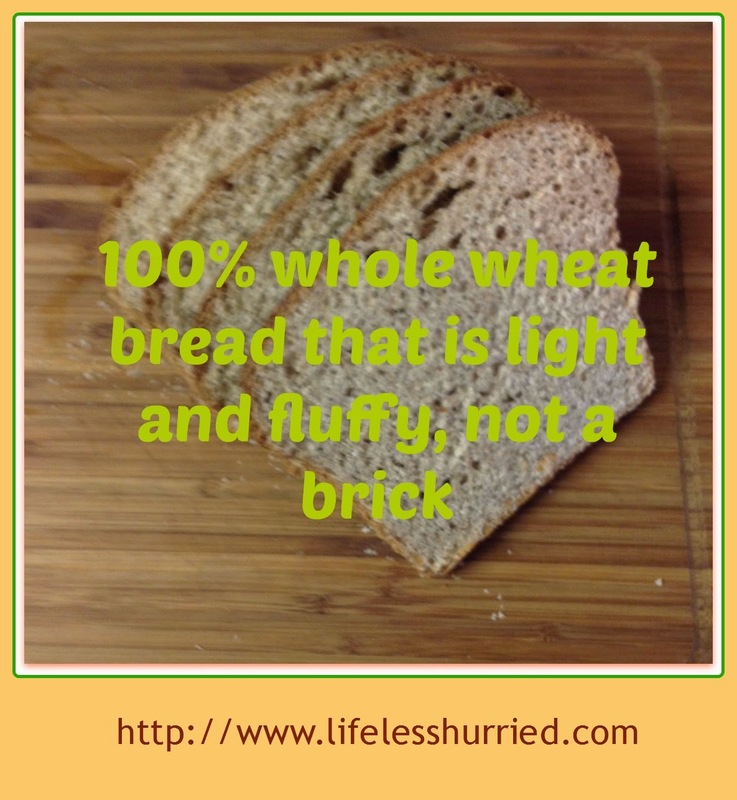 There are some better breads on the market then the ones I grew up with, but there are still many "whole grain" breads out there that seem to be healthy until you read the label. Bread (in my world) should be simple with flour, water, yeast, and salt. But when the list of ingredients gets to be 20 items long, and there is nothing that you recognize as food, we have a real problem. I wanted to bet back to the basics and learn to make "real bread" the way it has been done for centuries. It has taken some time, but I have learned to make 100% whole grain breads that are light and fluffy and wonderful to eat. Here are 3 keys to making 100% whole grain breads that are not so dense and brick-like. 1. Let your flour/grains soak. No, I am not talking taking a bath, I am talking about the very basic preparation of grains that has been all but forgotten in our modern world. Before you begin your bread you need to soak the wheat and/ or the flour. Why is soaking important? In a nutshell: soaking grains, nuts and seeds makes the nutrients more available to the body(it wakes them up), and it makes the food more digestible. The soaking of the flour also makes a difference in the flavor and texture. The Autolyse method of making bread where you soak your flour and then let it sit before adding your yeast can make a real difference in the texture and flavor. 2. Take your time. (something that modern bakeries do not do) Soaking your wheat takes time. The other thing that makes great bread is to use less yeast and let the yeast grow for a longer period of time. We see just the opposite of this in our culture. It is amazing to me that modern bakeries can produce a loaf of bread in a matter of minutes. The modern bread bakeries in the United States are achieving this by adding more gluten, more yeast, and more chemicals such as Bromine to the bread products therefore decreasing the amount of time it takes to create a loaf of bread. It is also extremely detrimental to our health. 3. The yeast matters. Caleb Warnock has spent time researching modern food and it's dangers. He co-authored a wonderful book about baking with natural yeast. I got a natural yeast start from him nearly two years ago, and I am never going back. Sourdough works here too, but I like baking with a sweet yeast as opposed to the sourdough. I hope that this has been useful information that you can use to better your health and the health of your family. For more information check out the links below. a bread a day has some interesting information and notes as she blogs about her bread making adventures for a full year. Check out these two great books on whole grain bread baking. I found this post so interesting. I've always used a mix of white and whole wheat flour for the reasons you mentioned but I'm going to try the method you recommend and see if I can make a light and fluffy 100 percent whole wheat loaf too! Pinned to my breads board on Pinterest. Thank you for sharing this post with us at the Hearth and Soul Hop! My favorite homemade bread was the cracked wheat my grandma used to make. Mmm. Very good post. It is amazing how we process everything and call it food. I love your recipe for real homemade wheat bread. This accurately sounds like real pure wholesome bread. thanks for sharing on Real Food Fridays Blog Hop! Sharing on google twitter & pinterest. We love homemade bread, this is a great post. Thanks so much for sharing your awesome recipes with Full Plate Thursday. Hope you are having a great week and come back soon! I used to make horrible bread that was like a brick until I learned by trial and error to make a beautiful loaf. It was easy to make good bread with white flour but the learning curve was harder with some of the whole grains. I have made bread for many years and grind my flour now. Thanks so much for sharing with Let's Get Real. Pinning to our group board. I have chosen your post as one of the features this week on Real Food Fridays Blog Hop! Thanks so much for sharing and looking forward to seeing your post every week. Have a health happy day.